Mitt Romney launched his presidential campaign in New Hampshire today with a scathing attack on President Obama's economic record, pointing to several lagging economic indicators he called "President Obama's own misery index." "Barack Obama has failed America," Romney said from a farm in Stratham. "When he took office, the economy was in recession. He made it worse. And he made it last longer." More than 16 million Americans are out of work or have stopped looking for work, he said, unemployment remains above 8 percent, foreclosures are still at record levels and home prices continue to fall. On top of that, the national debt has grown, as have food and gas prices. "These failing hopes make up President Obama's own misery index. It's never been higher," Romney said. "Mr. President, you've had your chance." Romney touted his own record as a businessman and entrepreneur, arguing, "the American ideals of economic freedom and opportunity need a clear and unapologetic defense, and I intend to make it because I have lived it." As conservatives wage court battles against President Obama's "individual mandate" -- the law requiring that all Americans purchase health insurance by 2014 -- Romney has had to explain why he implemented a mandate at the state level in Massachusetts. "The state was giving away over a billion dollars in free health care, much of it to people who could have paid something but were gaming the system," he said today. "You won't be surprised that a lot of Democrats thought we should be giving away even more. I took it on and hammered out a solution that took a bad situation and made it better. Not perfect, but it was a state solution for a state problem." The former governor quickly turned back to his economic record, noting that he balanced the state budget and cut taxes in Massachusetts 19 times. Health care reform is just one issue Democrats have already seized on to undermine Romney's campaign. Today, the Democratic National Committee released a web video that highlights some of Romney's seemingly conflicting statements on health care and issues like the bank bailouts and the stimulus. While Romney fends off charges he's a "flip-flopper," he also trying to craft a more relaxed image in his second bid for the White House. He stood before the New Hampshire crowd today in a button-downed shirt with no jacket or tie, peppering his speech with a couple of jokes about the Northeast. 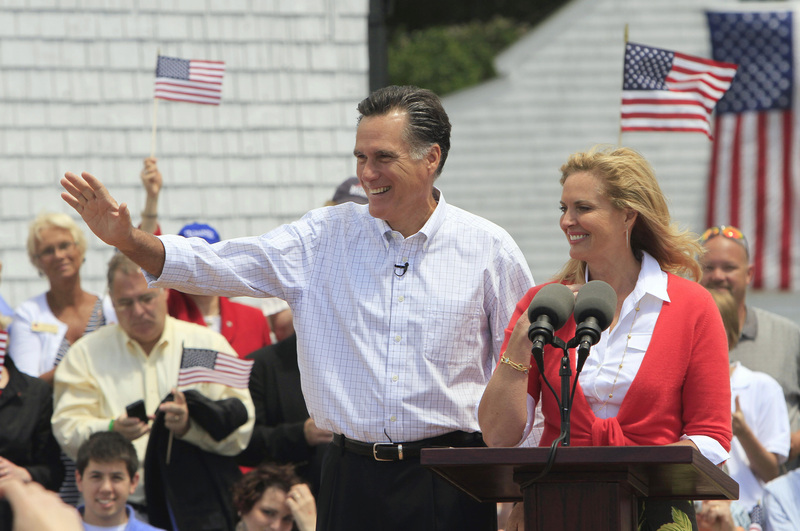 His familiar tone illustrated Romney's strong standing in the region and the state, where he will have to win the primary if he hopes to remain a viable candidate. His potential opponents aren't ceding the state to him, however -- Sarah Palin's "One Nation" bus tour stops in New Hampshire today, and former Utah Gov. Jon Huntsman is expected to make an appearance there this week as well. Even former New York Mayor Rudy Giuliani, recently named as another possible presidential contender, is in the state today. Romney's message today, however, focused on just one clear opponent -- Mr. Obama. He castigated the president for seeming to "take his inspiration not from the small towns and villages of New Hampshire but from the capitals of Europe." He blasted increased government spending and bureaucracy, including a "disastrous national health care plan" that he promised a "complete repeal" of. Romney also charged Mr. Obama is following Europe's lead in his relations with Israel, treating the U.S. ally "with suspicion, distrust and an assumption that Israel is at fault." While he criticized Mr. Obama's foreign policy, he did give the president credit for ordering the raid that killed Osama bin Laden, as well as ordering the troop surge in Afghanistan.